I am happy to announce that I am one book further on my quest to read everything Dervla Murphy has ever published. Having enthusiastically ticked off another title, I'm already planning library excursions to hunt for the rest. Wish me luck! In the meantime, let's talk On a Shoestring to Coorg. This is one of Murphy's earlier travelogues. 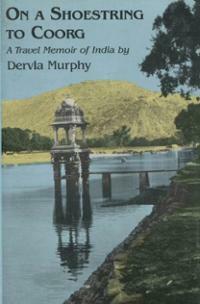 First published in 1976, two years after the actual journey, it takes Dervla - and the reader alongside - to India. She's accompanied by Rachel, her (then) five year old daughter. Both ladies wander around on minimum budget, explore whatever their fancy dictates, meet locals people of all sorts, battle minor injuries and generally take as much fun out of their adventure as it is physically possible. Some people may be outraged by Dervla's taking such a small child along on a rough journey, especially today when parents become increasingly paranoid about the safety of their offspring. The fact that Rachel survived (and immensely enjoyed) the trip is the author's best defence. Dervla did make some concessions to her daughter's tender age. She ditched her preferred means of locomotion (bicycle or pack animal) in favour of public motor transport and shortened the daily miles quota to suit abilities of a child. Even so, some parts of the memoir have potential to raise hair on heads of parental responsibility freaks. On the upside, all children around five are a goldmine of funny sayings and Rachel is no exception here. Dervla is generous in sharing her daughter's running commentary on the trip, which adds a lot of charm to the text's already plentiful graces. I'll refrain from quoting - read the book! - but some laughs are guaranteed. On all other fronts, On a Shoestring to Coorg is a typical Dervla Murphy book, off-the-beaten-track travel of the best sort. Levels of her hallmark activism are still low (not a bonus in my book, but some readers might find it a relief), so it's a pure travelogue, with only a handful of history/social sciences data thrown into the bargain. Dynamic, thought-provoking and extremely readable - that's Dervla Murphy for you.